Nursery Rugs For Boys build character! Getting a jump start on your young students' education is important, but so is developing strong character traits. We designed the Nursery Rugs For Boys with character in mind. 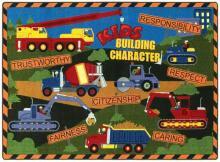 You will find character building words, such as caring, fairness, and respect. These words give your the perfect opportunity to describe what each trait comprises and the importance of exhibiting each trait in the classroom and at home. This rugs also includes colorful objects that give your students a chance to work on phonetic sounds. Many classroom rugs contain ink dyes that can release harmful fumes. We use printed dye to ensure the health of your students. Our tightly woven fibers do not come loose, meaning your students will not inhale loose fibers. Our attention to maintaining the health of your kids surpasses that of our competition. The Nursery Rugs for Boys exceed the toughest federally mandated indoor air quality standards, while also providing your students with a comfortable place to sit during show and tell. Choose from three sizes to meet your class enrollment needs.